[C]onstrained writing designates a form of literary production in which the writer submits his or her text to specific formal (and to a lesser extent also thematic) constraints. On the one hand, such constraints function as boundaries that explicitly limit the possible realizations of a text in some respects. On the other hand, those constraints are not primarily intended as strict limitations but rather as creative stimuli for the artistic process; they reduce the endless possibilities—the common, rather naive association of literature with boundless freedom and complete originality—and thus contribute to a stronger focus on the mechanisms on which genuine literature should be based: formal control and a maximal artistic concentration within an appropriate frame of constraints. The types of constrained writing referenced in the above quote, however, go further. Beyond the universal constraints, which apply to us all, authors also may find themselves subject to genre, or thematic constraints. As the article referenced above notes, such is the case with romance novels, which tend to follow a fairly established formula. So, too, the “fair play” mystery, which is expected to rigorously adhere to the rule that all clues must be fairly presented to the reader in advance of the solution. And, as discussed in previous columns, anyone writing pastiches – stories in which another author’s character is used – practices even a higher degree of constrained writing, attempting to capture the characters, the style, and the approach of the original author. So, like all limiting principles, constrained writing is a spectrum. At its outer limits are writing forms that go beyond the generally applicable constraints involved in fashioning a work that is consistent with the norms of the reading public and instead impose more artificial constraints devised by the author. An excellent example of this is the book Green Eggs and Ham, written by Dr. Seuss. The book was written on a dare from publisher Bennett Cerf that Seuss could not write a bestseller using only 50 words. Obviously the good doctor prevailed and, one would hope, collected. Other literary constraints are used often by mystery writers (myself included), as devices to hide clues. These include anagrams, in which the letters of a word are phrase can be re-arranged into a different word or phrase, and the acrostic, a favorite of Lewis Carroll, in which the first letter of successive lines of text, usually a poem, can be read vertically to reveal a hidden message. Another device is to restrict a portion of the text to only certain letters – an Ellery Queen mystery (nameless here; no spoilers!) does this in a message that is drafted in its entirety without utilizing one rather popular letter. As a general rule, particularly when the device is used to hide a clue, the goal is to apply the constraint in a manner in which it is undetected, at least initially, by the reader. The constrained prose or poem should read as though it was freely drafted, in other words, as though it was written without the constraint. The self-imposed constraints discussed above are fun for the mystery writer. They allow the writer to stretch his or her wings, and can provide means to hide the obvious; they challenge the writer’s skill to pull off the ruse. But as I said, constrained writing is a spectrum. Let’s take a deep breath and then explore what lies several turns down the trail. When the racetrack closed forever I had to get a job. There goes “when,” “the,” “I,” “had,” “to,” “get,” and “a” all before breaking free of the second line of the novel. The story that unfolds recounts the exploits of a gambler who, like the constrained author, has vowed to never do, or say, anything that he has said or done before. The book is clearly a tour de force. But, unlike the more manageable constraints discussed above, this is hardly one that the author can pull off without the ruse becoming self-evident. And suffice it to say that this also is a book that requires focused attention by the reader and should not be undertaken by a mind already mellowed by a few drinks! In writing such a story, -- purposely avoiding all words containing the vowel E, there are a great many difficulties. The greatest of these is met in the past tense of verbs, almost all of which end with “—ed.” Therefore substitutes must be found; and they are very few. This will cause, at times, a somewhat monotonous use of such words as “said;” for neither “replied,” “answered” nor “asked” can be used. Another difficulty comes with the elimination of the common couplet “of course,” and its very common connective, “consequently;” which will’ unavoidably cause “bumpy spots.” The numerals also cause plenty of trouble, for none between six and thirty are available. When introducing young ladies into the story, this is a real barrier; for what young woman wants to have it known that she is over thirty? And this restriction on numbers, of course taboos all mention of dates. As the vowel E is used more than five times oftener than any other letter, this story was written, not through any attempt to attain literary merit, but due to a somewhat balky nature, caused by hearing it so constantly claimed that “it can’t be done; for you cannot say anything at all without using E, and make smooth continuity, with perfectly grammatical construction—” so ‘twas said. 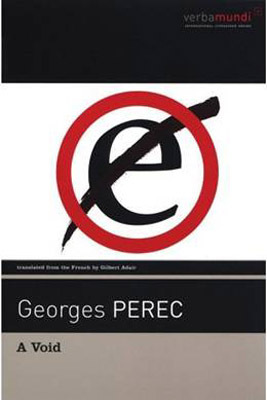 If the labors of Mr. Wright were not enough to shame those of us who at times profess writers’ block as an excuse to avoid lesser tasks, it should be borne in mind that there is also a French equivalent to Gadsby – La Disparation by Georges Perec, which also was written without using the letter “e,” and which was subsequently translated into English in 1995 as A Void. The translator, Gilbert Adair, accomplished the translation also without using that banished letter. Marvel at the feat of the author, but stand in awe of the constraints borne by the translator! As Wright noted, with severe literary constraints writing style invariably suffers. That is not to say, however, that pathos cannot be found in all of this. Think of the sad plight of that which has been left behind in constrained writing – the letters, or words, or phrases that are shunned, exiled from the story through no intrinsic fault of their own. Think of the poor little “e’s.” Mr. Wright, in his constrained zeal, did not ignore their sad plight. People, as a rule, will not stop to realize what a task such an attempt actually is. As I wrote along, in long-hand at first, a whole army of little E’s gathered around my desk, all eagerly expecting to be called upon. But gradually as they saw me writing on and on, without even noticing them, they grew uneasy; and, with excited whisperings amongst themselves, began hopping up and riding on my pen, looking down constantly for a chance to drop off into some word; for all the world like sea-birds perched, watching for a passing fish! But when they saw that I had covered 138 pages of typewriter size paper, they slid off onto the floor, walking sadly away, arm in arm . . . . The quote usually attributed to Churchill is a smackdown of somebody who complained of his using a preposition to end a sentence with: "This is the type of arrant pedantry up with which I will not put." I like the story of a student who asks where the library is at, is chastised, and replies, "Okay, where's the library at, @$$#*%&?" Dale, as you know I've been interested in constrained writing, but I hadn't considered it to the depth you smartly delve into, such as the obvious, say poetry. The French society, L'Oulipo, practices constrained writing in a public annual event as if it were a sport. It's important to our genre that Georges Perec's novel, The Disappearance, was a detective novel in which amateur detectives search for their companion, Anton Vowl. I can't imagine Nufer's task… whew! Other examples include Thomas Pynchon's Gravity's Rainbow and Criminal Brief's (in)famous Christmas contest, as practiced by our board members. The original Wetzel edition is now available at the Internet Archive (sans the Modernist cover). Or you can look for it at Amazon's Kindle Store (complete with a behind-the-scenes essay, Skipping Fifth). Most writing with the usual constraints I, a reader, probably don’t pay much attention to. But now I’ll have to read the two novels you mention just to see what kind of strain they put on my slowly declining attention span. Gellett Burgess pulled off a trick like in the Queen book in his collection "The Master Of Mysteries." (So well-documented I won't spoil it here!) Love to be able to get away with that! Loved every letter of this post, Dale! Nice to read this.Thank you so much for sharing this . Why Can’t I Listen To Audio Books?